Serving with the NYPD between 1923 and 1947, for over two decades John “Johnny” Broderick struck fear into the hearts of New York’s deadliest criminals working as a no-nonsense detective who wasn’t afraid to throw hands and kick bad guys through windows (literally). Over his long and controversial career, Broderick earned over half a dozen medals for valor, a nod from the president of the United States and the begrudging respect of the criminal underworld who, when they weren’t referring to him by various expletives, referred to him as “the one man riot squad”. Born in 1896 in the Gashouse District of Manhattan, New York, Broderick had a hard, unforgiving early life, quitting school at just age 12 when his father died so that he could drive trucks to earn money for his family. When WW1 rolled around, Broderick dutifully enlisted in the Navy and took part in his only known official pugilistic bout, ironically enough given his later reputation, being summarily knocked out in the first round by an unknown seaman. At the close of the WW1, Broderick used the connections he’d made driving coal trucks to secure a job in the Teamsters union, where he eventually came to the attention of labor leader, Samuel Gompers. 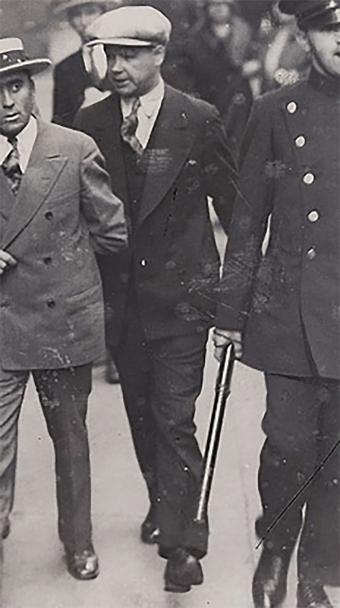 Gompers hired the 5 foot 10 inch, 170 pound Broderick to serve as his personal bodyguard after hearing stories about Broderick’s skills with his fists. Broderick grew tired of being a bodyguard and in 1922 he applied to become a New York City fireman, passing the physical exam with flying colors. However, he soon became disillusioned with the nature of the work which he described as “boring”. Somewhat ironically, after quitting the fire department and enlisting as a police officer in 1923, the first thing Broderick did was rescue two children from a burning building hours into his first shift. Heroics like these saw Broderick promoted from beat cop to detective third grade just three months after joining the NYPD. This was an impressive, almost unheard of feat that Broderick topped not long after by being promoted again, and then the year after that was promoted a final time to detective first grade in 1926. To put this in perspective, in just three years Broderick earned three promotions that often took regular officers their entire career to achieve. The New York Herald Tribune noted that his rapid rise must have been the result of “extraordinary luck or influence or both”. While rumors of backroom deals and connections from his time as a union man dogged Broderick’s meteoric rise through the ranks of the NYPD, stories of his penchant for doling out justice with his fists in an era when criminals often openly skirted the law earned him a great deal of goodwill with the public and his fellow officers. The newspapers particularly ate up Broderick’s exploits, gleefully reported stories about him attacking various criminals just because he could, whether he caught them doing anything wrong or not. For example, Broderick became infamous for his habit of slapping known criminals upside the head with a rolled up newspaper. If that doesn’t sound so bad, it should be noted that the newspapers in question generally had an iron bar hidden inside, allowing him to beat suspects unconscious in broad daylight, but later still able to claim in court that he had only given them a playful whack with a newspaper. Broderick was seemingly unafraid of even the most fearsome gangsters and was known to respond to the threats on his life by driving over to the gangster who made the threat’s house and attacking him. The most famous occasion of this was when high-profile mobster Legs Diamond was drinking one night with his cohorts and, after calling Broderick various uncouth names, stated he was going to “take Broderick for a ride tonight”. Diamond and crew then began to hunt for Broderick to make good on the promise. Other lowlifes who heard about it joined the entourage, eager to see the spectacle. Unfortunately for Diamond, Broderick also heard about it and began hunting Diamond in turn. Newspapers later reported that soon enough Broderick found him at the corner of 46th and Broadway. Broderick approached Diamond and co. stating, “I understand you are looking to take me for a ride”. At this point, Diamond’s bodyguard fled, leaving Diamond to face Broderick alone. With his wingman out of the picture and a whole crowd of underworld types looking on, Diamond tried to play the whole thing off, reportedly stating, “Ah, listen Johnny, can’t you take a joke?” It was at this point that Broderick punched him in the face and then unceremoniously dumped him headfirst into a nearby garbage can. Broderick: Hey, they got you, Crowley. Why don’t you give up? Broderick: Aw you’re nutty, Tell you what I’ll do: I’ll go around the corner for two hours. If you ain’t out by then I’ll come in and get you. Later, after firing an estimated 700 rounds at the building and lobbing tear gas in, Broderick and co. ran back to the door and knocked it down. They found an injured Crowley (shot four times) inside. He pointed his gun at Broderick, but rather than try to get out of the line of fire, Broderick simply approached stating, “Drop that gun, y’runt, and keep your hands in the air”. When he got close enough, he punched the injured Crowley in the face and disarmed him. Another of his widely reported exploits occurred five years previous, in November of 1926, when he put an end to a standoff at The Tombs prison in Manhattan. In an attempted prison break, three prisoners, Hymie Amberg, Bobbie Berg, and Red McKenna, killed a guard and the warden and ended up trapped behind a coal pile. When Broderick arrived, rather than duck for cover as the rest of the police were doing, he grabbed a metal garbage can lid as a shield and sprinted towards the shooting criminals. From here, the news report that came out directly after the event stated the criminals in question saw it was Broderick coming at them and simply committed suicide instead of face him… However, the truth seems to be that once Broderick got to them and started firing at close range, they fled the coal pile and, now without cover, were gunned down by the police. Yet another tale of this John McClane style, Hollywood-esque policeman reported in the news was an instance where he did a very un-Hollywood thing that resulted in a car containing five armed gangsters flipping over during a high speed chase. How? He leaned out of a police car travelling at high-speed and, instead of aiming at the occupants as is generally the moronic strategy in movies, he simply shot out one of the tires. Broderick’s exploits didn’t go unnoticed by celebrities who began requesting Broderick’s services as a bodyguard when they visited New York. This culminated in Broderick being personally asked by President Franklin Roosevelt to lead his protection detail when he attended the 1936 World Series. Similar requests were made by the Queen of Romania and the King of Belgium when they were in town. Despite his fearsome reputation, somewhat questionable crime fighting tactics, and how famous Broderick was nationwide at the time, Broderick was known to be a generally humble, down to earth guy when he wasn’t on the job. He almost never talked to the press about any of his heroic acts, except through official police reports. He also refrained wholly from smoking and drinking and typically spent his free time at home with his wife or exercising at the gym. This not drinking or smoking bit was an important one to him, as told by one of his friends, Toots Shor, who owned a pub in town. One night Shor claimed he called Broderick up as actor Edward G. Robinson was in his pub and wanted to meet Broderick in person. You see, Robinson had played Broderick in the 1936 movie Bullets or Ballots. Broderick was also a complete teddy bear when it came to women and children, never hesitating to walk young women home at night if they felt unsafe and offering his services as a bodyguard, free of charge, to women who’d been victims of domestic assault, occasionally visiting their former partners to “teach them a lesson”. In one instance, the New York papers reported that Broderick beat up several young men who had been harassing women on the street. Then, for good measure, Broderick tossed them each through windows so that he could arrest them for malicious destruction of property. It was reported that they all got 30 days in jail for the charge of destruction of property. Nevertheless, Broderick took excessive force to a whole new level. In one instance in 1937, the New York Supreme Court even had to step in, freeing a prisoner long before his sentence was complete. Why? Think Captain Hadley / Bogs in Shawshank Redemption. They stated in their ruling that Broderick had “beat him so badly that he will be a cripple for life. I think this man has more than expiated his crime.” On top of the severe beating, the man was given no medical attention while in police custody. Yet again, Broderick got off scot-free. On top of this, the Industrial Squad (later repurposed as the Gangster Squad) of plainclothes officers Broderick led for a time was frequently cited for excessive force- not against trying to break up crowds of strikers by breaking various parts of said strikers’ bodies. In one instance in 1926, the American Civil Liberties Union accused the Industrial Squad of attacking the Interborough Rapid Transit Company workers, seriously injuring 20 of them, for no reason. Broderick claimed it was self defence, as he did in many other such instances. Of course, the Industrial Squad didn’t always intervene in strikes and there were several accusations over his career that Broderick and his fellow officers on the squad often offered to “protect” the strikers from such beatings (and look the other way when strikers attacked scabs) if the union officials would pay them for it. In each instance, however, Broderick and his crew were cleared of all charges or in other cases no action was taken to investigate the accusations. It should be noted here that Broderick was known to walk around wearing thousand dollars suits, drove a Cadillac and owned a luxurious apartment in Queens he somehow maintained on a $4000 a year salary ($70,000 today). However, due to the public perception of his unflinching dedication to duty (whether an accurate portrayal or not), Broderick was seldom reprimanded for his actions and the numerous complaints filed against him for assault and excessive force were largely swept under the rug. Even lawsuits against him, which weren’t that uncommon, were typically thrown out by judges who were friendly with, or juries who admired, Broderick and his efforts to clean up the streets of New York. Within a few years of this, he was reinstated to detective but the problems didn’t go away and by 1947 he was very quietly forcibly retired from the police force by Mayor William O’Dwyer amidst accusations that Broderick was in cahoots with gangsters. You see, it was discovered that in November of 1946, Broderick had accompanied ex-convict Ben Kaye to Hot Springs, Arkansas, where the pair met up with mobster Owney Madden for undisclosed reasons. Broderick later denied that there was anything fishy about this, stating that he frequently associated with various gangsters and other criminals to keep tabs on what was going on with the criminal underworld in New York; it was just part of his job. After retirement, Broderick made an unsuccessful bid for political office in 1949, but the aforementioned reason why he retired came to public light and his political aspirations went down the toilet. He then sold the rights to his life story to RKO Pictures for $75,000 (about $753,000 today). A script was made, tentatively called “Broadway’s One-Man Riot Squad”, and actors hired, but they never got around to making a film based on his life due to budget concerns. Broderick took the money and retired to a farm where he raised horses and dogs. He died in 1966 at the age of 70 with newspapers across the nation hailing him as “The Toughest Cop in the World”. One of the rare times Detective Broderick was outsmarted by a crook.